SLC 2019 Official Winners List! Please click the "More" button below to download the official results from the 2019 State Leadership Conference! Congratulations to all our winners! Click the "More" Button below to go to the Archived Video Page and watch the Opening General Session, as well as the Middle School, Postsecondary, and Secondary Awards Sessions! HOSA: Future Health Professionals is a National (and International!) Career and Technical Student Organization (CTSO) endorsed by the U.S. and Florida Departments of Education and the Health Occupations Education Division of the Association for Career and Technical Education. Please visit the National HOSA Homepage for more information. 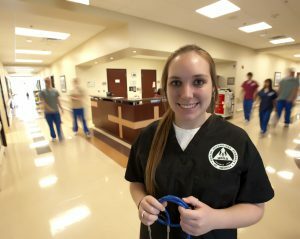 HOSA provides a unique program of leadership development, motivation, and recognition exclusively for middle school, secondary, postsecondary, adult, and collegiate students. HOSA is 100% healthcare! HOSA is not a club to which a few students in school join. Rather, HOSA is a powerful instructional tool that works best when it is integrated into the Health Science curriculum and classroom. Health Science instructors are committed to the development of the total person. Those who join the Health Science – HOSA Partnership recognize the importance of providing students with training far beyond the basic technical skills needed for entry into the healthcare field. The rapidly changing healthcare system needs dedicated workers who, in addition to their technical skills, are people-oriented and capable of playing a leadership role as a member of a healthcare team. HOSA has more than 230,000 members in 49 states, Canada, American Samoa, and Puerto Rico. Florida HOSA has the second largest membership at close to 16,000! A growing organization, Florida HOSA is constantly changing to meet the needs of its members.